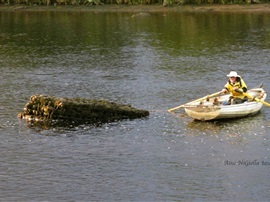 Pat Liston after a relaxing spin in his canoe. 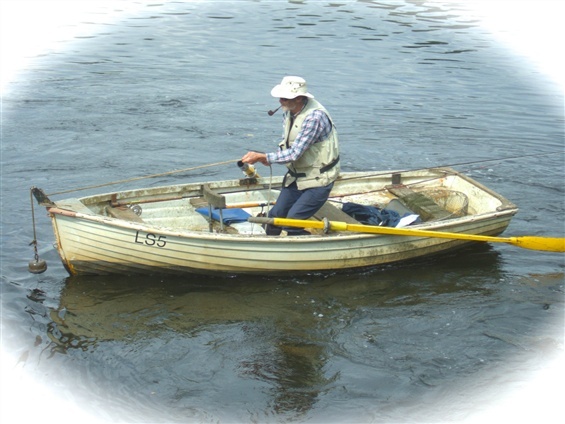 Dan Gallagher ready for home after doing a spot of fishing. Pat Lysaght cleaning up the river as usual. 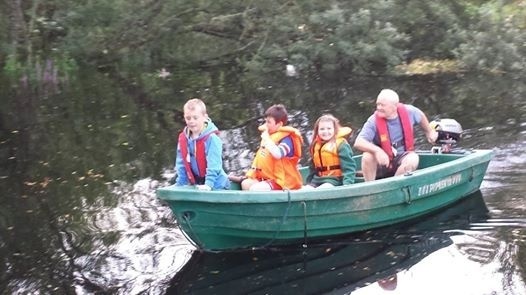 John McNamara taking his grandchildren for a spin at high tide. 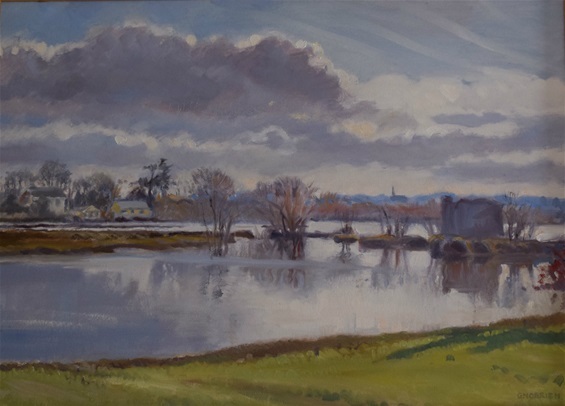 Painting by Geraldine O'Brien from Parteen-a-Lax, looking across the river at Corbally. THE GATHERING CHRISTMAS DAY 2013 - Neighbours, friends and relatives as far away as U.S.A. St. Lucia and New Zealand gathered on the Green, Mill Road, Corbally. The event was hosted by the Gallagher family. 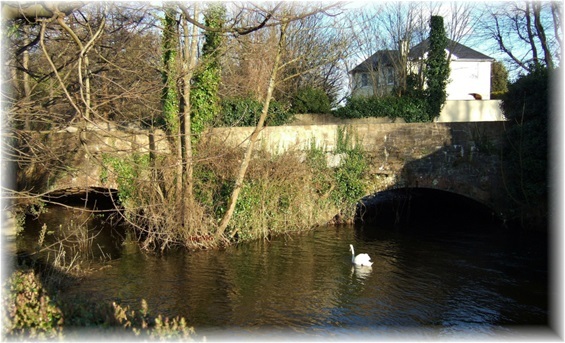 Not many realize they are crossing over a two arch road bridge at the very end of the Mill Road to what was known as "The Green", now the car park. From the Green one has a spectacular view of what is left of the Great Lax Weir, the Castle, St. Thomas's Island, the Falls, Liberty Rock at low tide and depending on the time of year a view of St. Patrick's Protestant Church, Parteen. Two Arch Road Bridge over the Mill Stream. THE GREEN. On the left of the Green is Gabbett's Grove better known in the 40's, 50's and 60's as "The Huts". On the right of the Green is the start of the Red Path. 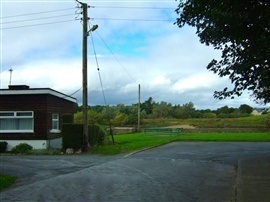 CORBALLY COTTAGE. Beside it is the entrance to the Red Path riverside walk. it was destroyed by fire in the 70's and a new house built on the same site. 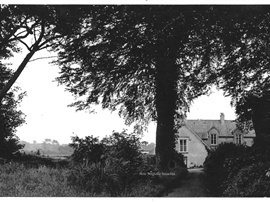 Previous owners were Roger's, Walnutt's up to 1966, next Richard Edmunds from 1966 to 1977. 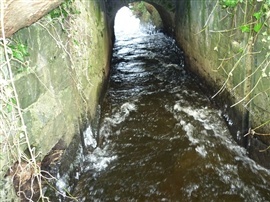 THE SLUICE. 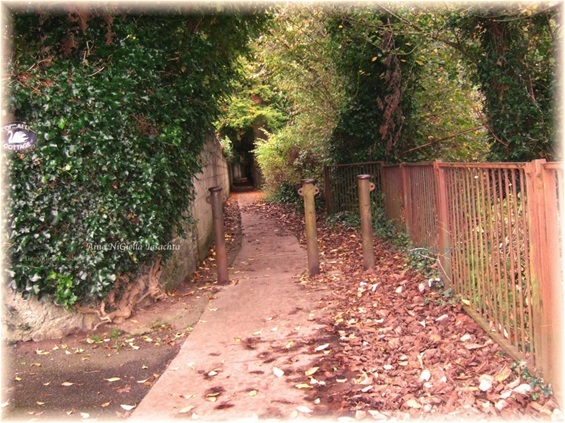 The sluice runs under the road just in front of Corbally Cottage and entrance to the Red Path. 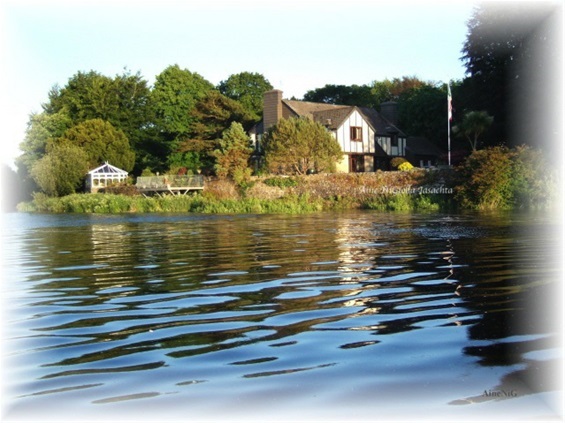 A view of the new "Corbally Cottage" from the river. Owners were O'Mara's, then Berges from 1997 to 2014, next and present owners are John and Carmel Daly. 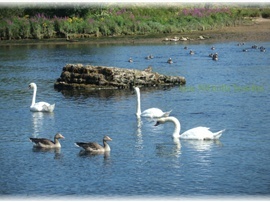 During Berges ownership, Serita a keen gardener, created a magnificent prize winning garden, visitors came from all over to see it. 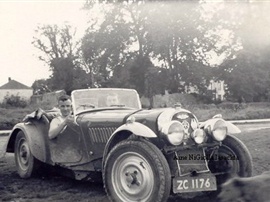 Brothers William and Desmond Lysaght in a Morgan Sports Car on the Green, Mill Road 1953. LIBERTY ROCK can be seen in the middle of the river at low tide from the Green. 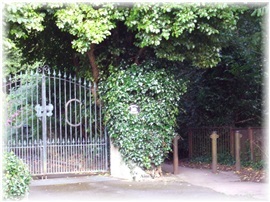 It marks the boundary between Limerick and Clare. Start of Red Path from the end of Mill Road. Tony Darcy's caravan on the Green, overlooking the Shannon River 1953. When Tony Darcy's caravan came down the Mill Road, drawn by a borrowed horse, Patrick and Terry Kinsella on seeing such a rare sight, raced home as quickly as they could to tell their parents that the gypsies were coming, a bit of a panic ensued until all got to know Tony, an experienced basket maker, Tony a nice man, integrated into the hut community very quickly. 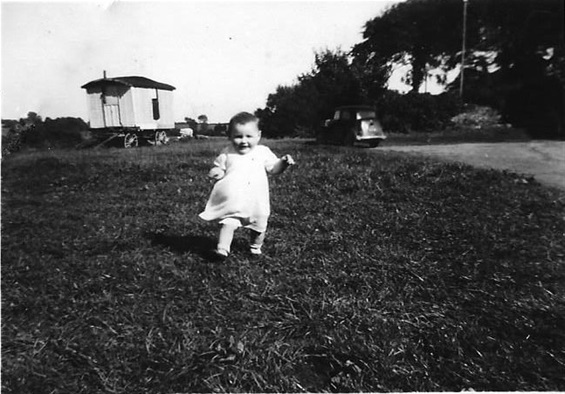 The child in the photo is 12 month old Maura Lysaght. 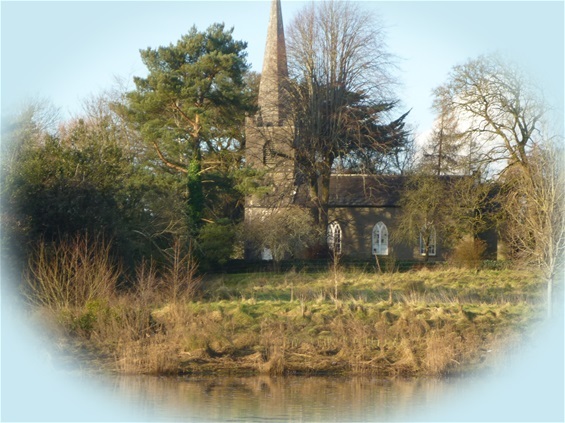 In Winter time when the trees are bare, it is possible to get a nice view of St. Patrick's Protestant Church, Parteen, Co. Clare from the Green at the end of Mill Road. At Mill Road journey's end. Marking his master's every move. As they descend to the waiting boat. To the envy of his mates. In search of better things. 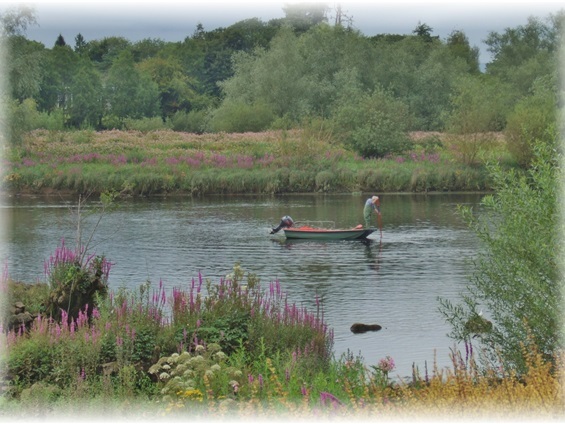 DAN GALLAGHER preparing to do a spot of fishing at Liberty Rock, Corbally. 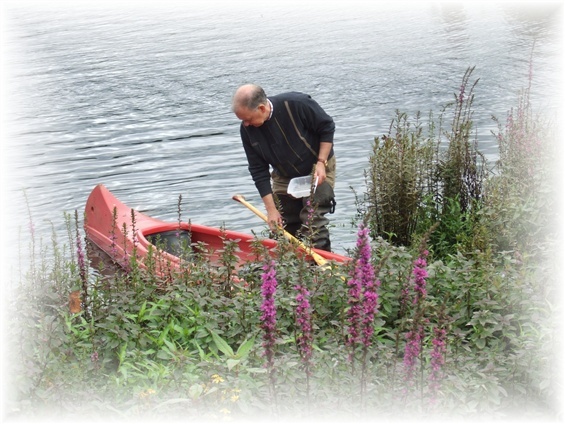 Maureen Sparling dedicated this beautiful poem "A Fisherman and His Dog" to fisherman Dan. 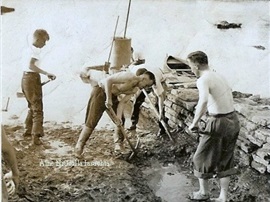 Building of the boat slip at the end of Mill Road. William (Nay )Lysaght, Frank Ahern, Tom Molloy. Another one of 4 known Block houses in the area. 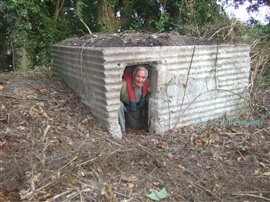 This one in the vicinity of the Tail Race was recently uncovered by E.S.B. workers during repairs to power lines after the big storm February 2014. Pat Lysaght investigating the initials P.H and D.K. 53 inscribed on wall inside.